Have you ever done yoga while a sheet of rain obliterates all visibility of the world around you? Or tasted drinking chocolate so rich and spicy that you would swear you are holding a melted bar of pure chocolate in the cup before you—or somehow been transported to the seductive marble counter of Vianne Rocher’s French-Mayan Chocolaterie? Or sat in a hot bath with crimson and peach rose petals strewn over the surface, the scents of jasmine and ylang ylang spiraling with the steam towards the ceiling, while bells toll the hour softly out the open window? 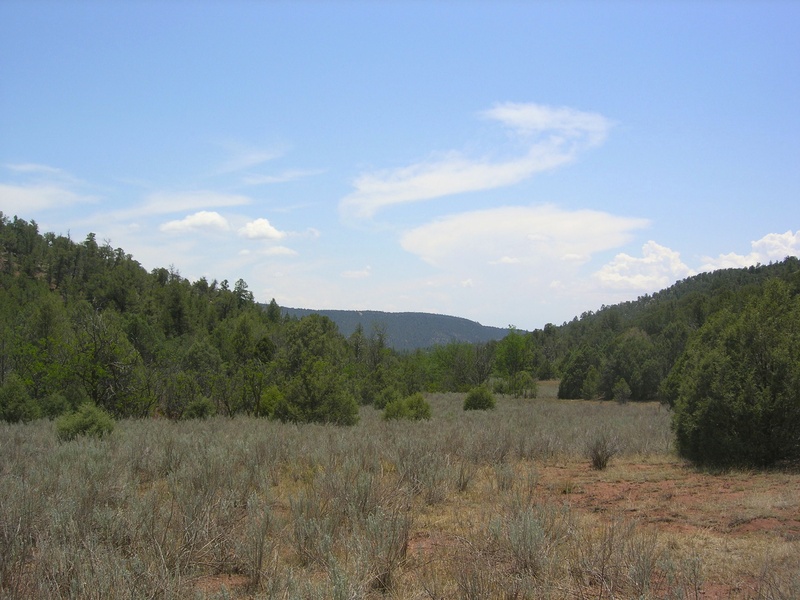 This is just a taste of the joys I had the great privilege to experience in the second half of my visit to New Mexico, a week I am now looking back on with awe and gratitude for the level of both bliss and adventure I was able to experience. On the afternoon of the day I wrote my last post, I went with the friend I was staying with to pay a visit to an acquaintance of hers who is now a retired harp maker. 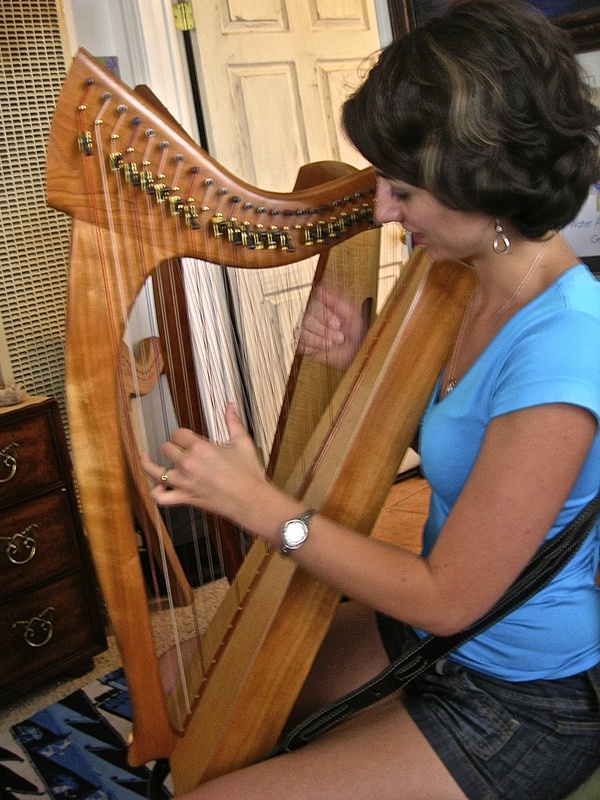 His business was called Harps of Lorién, so I had a good feeling we would get along well. He had only kept two of his harps for himself—the last ones he made—and I had the great joy of being able to play them for a little while. The larger of the two harps had just under five octaves; a beautiful creation with a rich sound, especially in the upper register. The other harp was a lovely little lap harp with 27 strings, the kind I could easily imagine myself carrying on my back on some mythical adventure. Playing them I was reminded of a trilogy I recently read that a friend recommended to me: Riddle-Master by Patricia McKillip. The series is composed of three books, The Riddle-Master of Hed, Heir of Sea and Fire, and Harpist in the Wind. As one can imagine from the final book title, harps play a significant role in the unfolding of this story. From harps we moved on to chocolate, a transition no one I know could complain of. I was brought to the Kakáwa Chocolate House where we were greeted with an extensive menu of both European and Meso-American drinking chocolates. After tasting several different samples I settled on the Chile Chocolate, which was made of 100% chocolate, coconut sugar, chile, and Mexican vanilla. 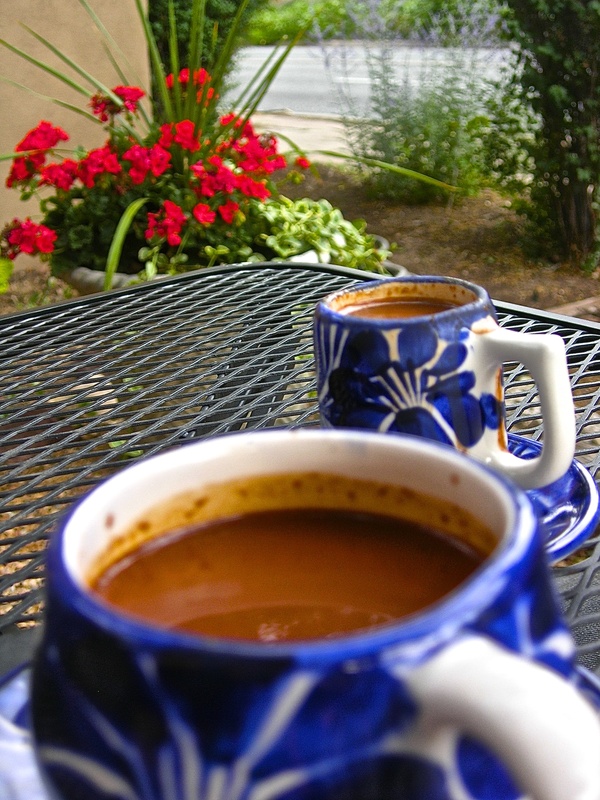 The thick liquid was both sweet and spicy, rich and rounded, calming and awakening. It was, to say the least, amazing. Truly an extravagance. Our evening plans brought us into central Santa Fe where we had dinner at a restaurant called Blue Corn, followed by drinks at a nearby bar called Thunderbird. My astrological twin and I, of course, ordered the same drink, a cocktail of vodka and crisp pear. Our parallels no longer surprised us, especially when it was something as simple as choosing a drink, or wearing identical socks or pants. Our differences were becoming far more interesting to discover and explore. The following day, Sunday, my friend and I went back to the land in Glorietta to hike around the area where she and her partner are building their home. The day was cooler than when we were up there on July 4th, or perhaps I was just becoming acclimated to the altitude and desert sun. Clouds were gathering on the edges of the horizon but we still baked under the clear blue of the sky directly over our heads. Walking through the forest of ponderosa pine and cedar I started to notice a distinct smell that would hit me every so often, almost like kaffir lime leaves. What was an essential ingredient of Thai food doing out here? Finally, when I smelled the scent again I stopped and looked all around me, making note of any different plants that might be nearby. To my right was a low tree with gnarled bark and pointed, needle-like leaves. Silver-green berries grew in clusters between the leaves. I took a step closer, realizing the kaffir smell came from this tree. 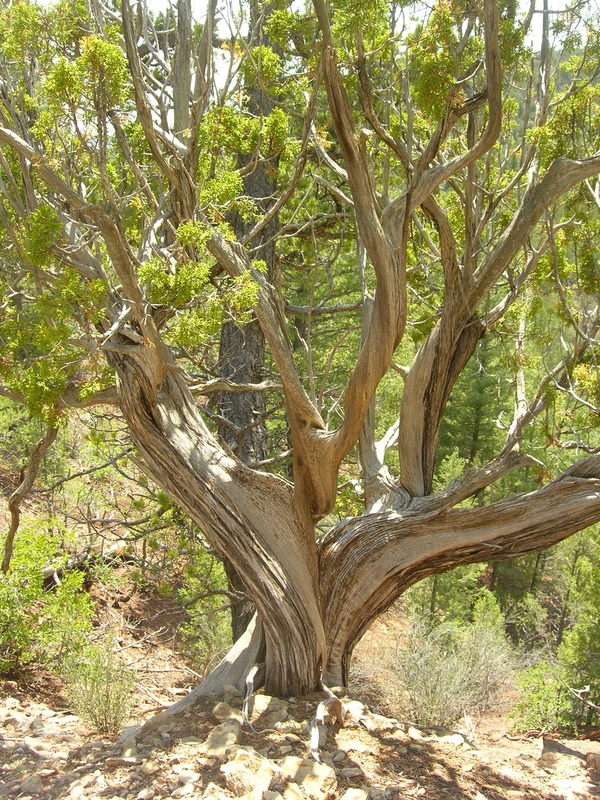 A juniper. I never would have guessed the two smells would be so similar except through this accidental discovery. Passing under the eaves of this sparse forest we walked out into an open meadow, a long, snaking expanse of shrub-covered ground that formed a valley between two wooded hills. Gazing overhead we saw a hawk soaring, a local inhabitant my friend recognized because of the distinctive missing feather she had in one of her wings. We climbed up one of the hills to look back down on the meadow we had just crossed. Directly opposite on the hill facing us, at a point not much higher than where we stood, the dark entrance of a cave was just visible between the trees. My friend speculated that this cave might be the home of the hawk that was still circling above us, although she was not sure. After returning to downtown Santa Fe, I spent the rest of the afternoon on a quiet meander through the town’s streets, pausing at the stalls of artists and vendors, admiring the bright silver and turquoise that was a prominent theme of the jewelry for sale here. The clouds continued to gather in the sky, making their way towards the town, their dark underbellies heavy with rain. Finding myself in the grassy plaza I sat beneath a tree and took out my watercolors to begin painting a scene I had been holding in my mind since that morning. The sunset that night was so brilliant—an explosion of bleeding vermillions and reds, rosy oranges and deep purples—that no photo could even begin to capture it. 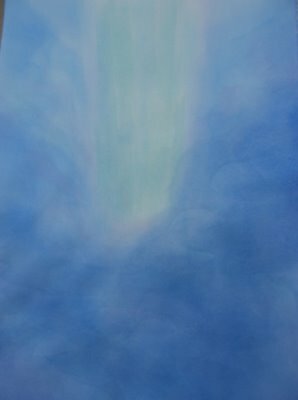 I sometimes wish I could bring a painting forth all in an instant, the colors pouring from my open imagination directly onto the page. But the exact wash of that particular sunset, the ways its unique colors flowed together and blended, is fading from my memory with as much certainty as it faded from that night sky. 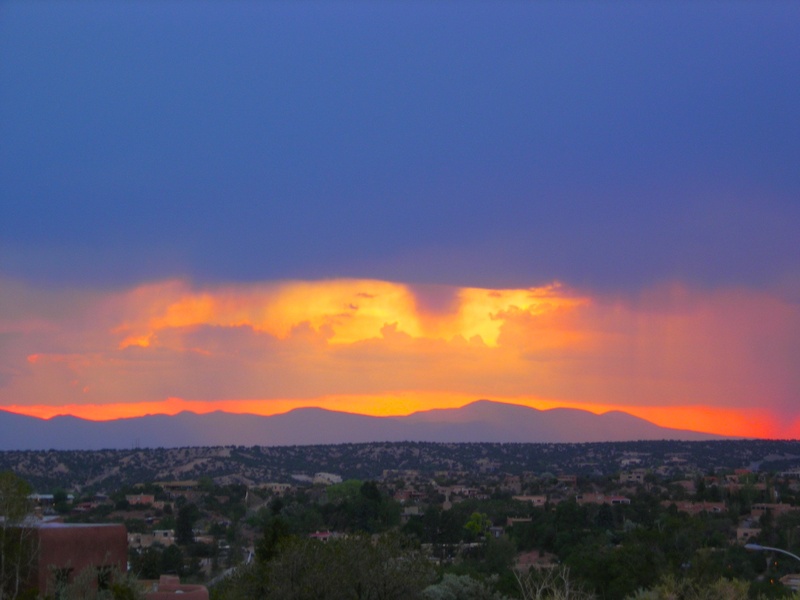 In many ways I feel my time in New Mexico was like that sunset: so beautiful and profound, surprising and unexpected, a crescendo of connection and experience. Returning to the grey fogs of San Francisco felt a little like a shock, the stark white of the sky such a contrast to the desert colors I still held within me, memories like precious gems, each expressing different emotions through their dynamic colors. My astrological twin and I are two Sagittarians who walked together down a spiraling path of an eternally growing checklist of activities: from baking cookies and pumpkin pie to turning our toenails into artistic canvases; from sampling at a delicious gluten-free bakery to a morning of pampering at the spa; from astrological readings and healing massages to crafting beautiful gift collages; from deep conversations and gorgeous laughter to the freedom of just being utterly silly. So much of what happened during my week in New Mexico was so simple, an extended playdate between two sisters, butterfly twins who had somehow only recently met—at least in this lifetime. 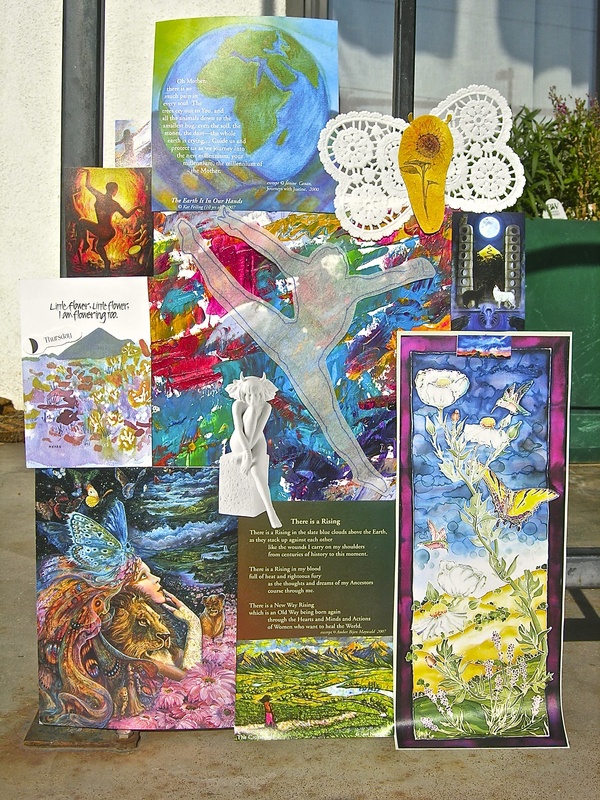 This series of four paintings is a visual response to the content of Chris Bache’s course The Birth of the Diamond Soul, offering different images of the reincarnating soul both inside and outside the influence of time and space, as well as an homage to the devastation of the ecological crisis and how it may be the catalyst for the forging of the Diamond Soul. The Oversoul is a term used by Bache in his book Lifecycles to describe the larger soul overseeing, but also incorporating, each incarnating human life. It is simultaneously a single entity, but also a family of entities nested within each other, and ultimately nested within the larger and larger spheres of existence. This painting is one representation of the Oversoul, pictured as a nautilus, an image Bache provided in class. The chambers of the nautilus each represent a human incarnation, yet the whole shell is the full soul. 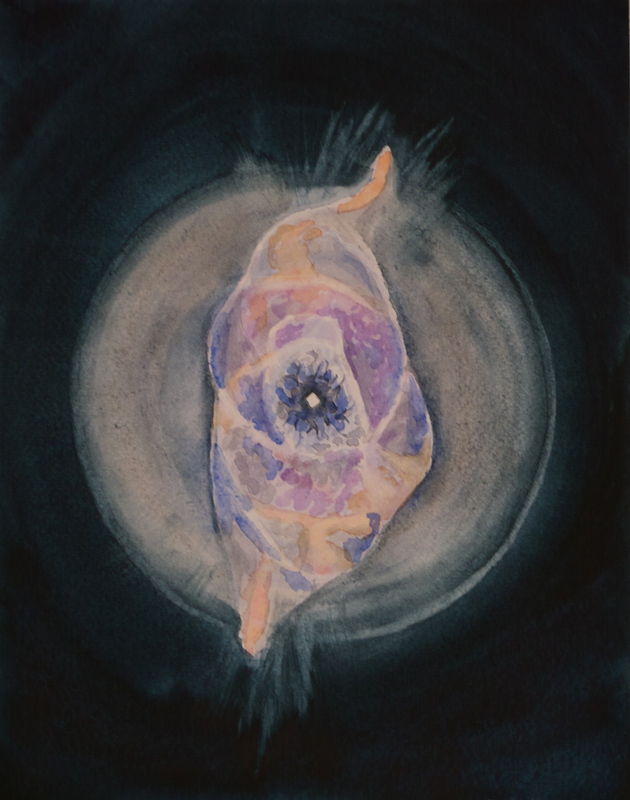 I have depicted a waiting fetus gestating within each chamber as a symbol of these lives. The life about to be born resides in the outermost chamber, with a diamond in potentia within his heart. The diamond represents the Diamond Soul being forged slowly over the course of each lifetime. A second diamond resides in the center of the nautilus representing the ultimate birth of the Diamond Soul at the end of the incarnational process. 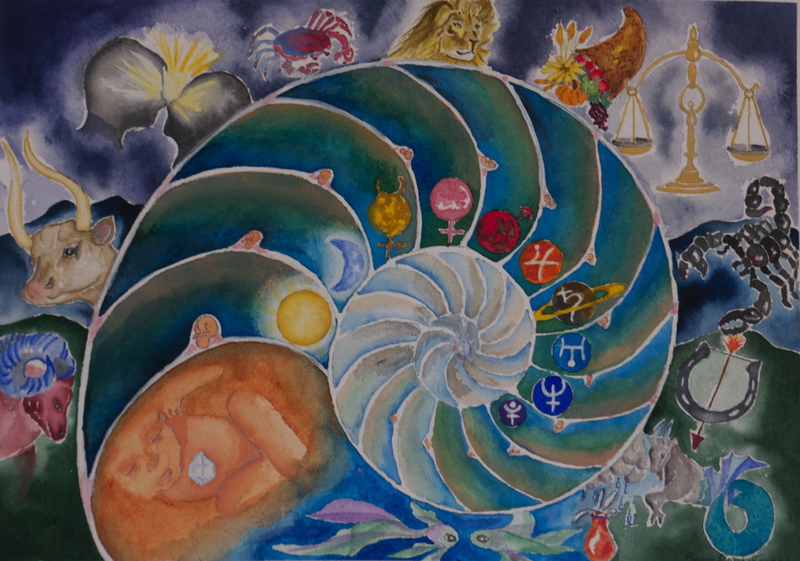 The pantheon of planets within the nautilus and the zodiacal signs surrounding it indicate the archetypal influences on each life and upon the soul as a whole, each chamber of the nautilus having a different perspective and relationship to the signs and planets that characterize that particular life. 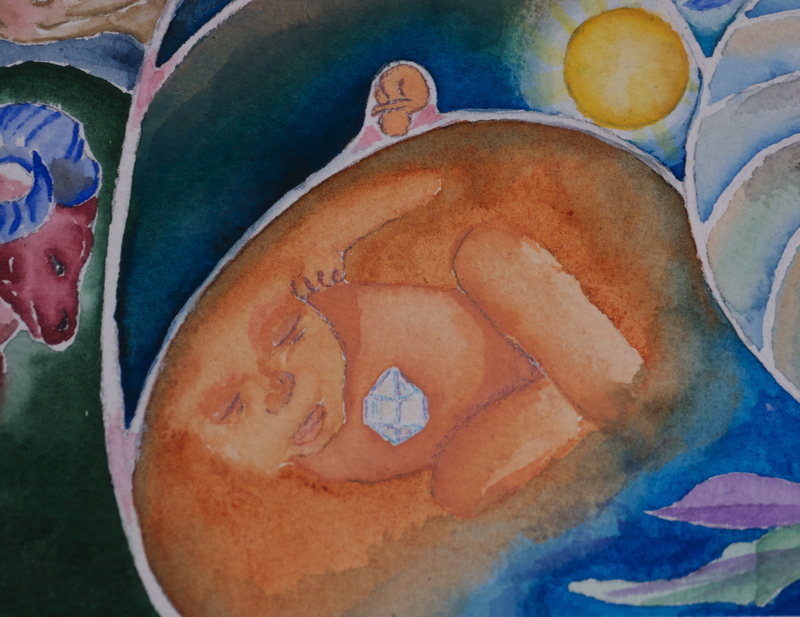 The baby about to be born residing in the outermost chamber is within the realm of Pisces, both as a fetus in the aquatic realm of the womb, but also as a symbol of our current times since we are in the Age of Pisces. The vision of this painting came to me nearly in complete form when I began contemplating the nautilus as a metaphor for the Oversoul. To my delight, each of the zodiacal signs took on a life of their own as I painted them, as I had not pictured their exact form before drawing them in. I was particularly surprised by the form Sagittarius took, as a horseshoe doubling as a bow with an arrow. The animals also each took on their own personality seemingly independent of my intentions for them. The real surprise came as the baby being born into the Age of Pisces, for it was pure synchronous chance that the nautilus opened into the sign of Pisces, yet it seemed to fit perfectly with the concept behind the painting. In an effort to visualize the concept of the Diamond Soul, Bache introduced us to several images from the natural world that might represent parts of the Diamond Soul, ranging from blossoming flowers to nebulae. This particular nebula, the Cat’s Eye Nebula, is one that conveys the idea in an especially evocative way, with its ethereal explosion and heavenly sacrificial blooming. The core of the nebula, as can be seen in all the images captured of it, is a pure white space resembling a diamond. 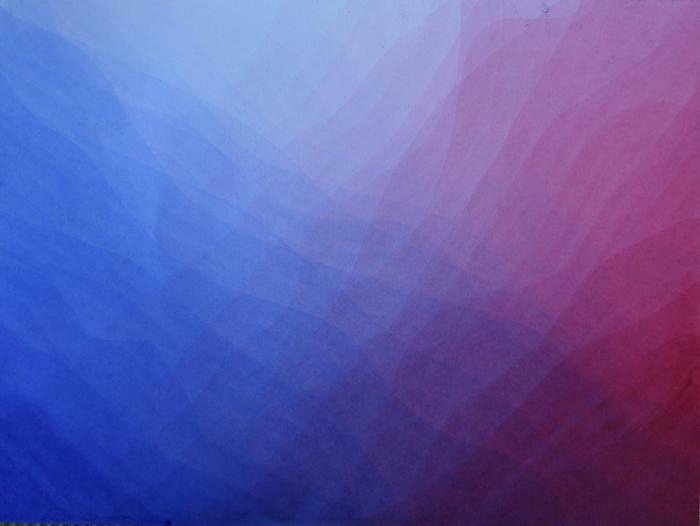 I found in my attempts to paint this nebula with watercolor that portraying the light and darkness, the veiled colors of the celestial event, was much more difficult than I had previously expected and took more than one try. When one looks at a photograph of a nebula it is the qualities of the whole that are so compelling, but in painting it I had the experience of becoming intimately familiar with each part, trying to understand where the colors blend and where they do not, yet also attempting to capture the whole as well. 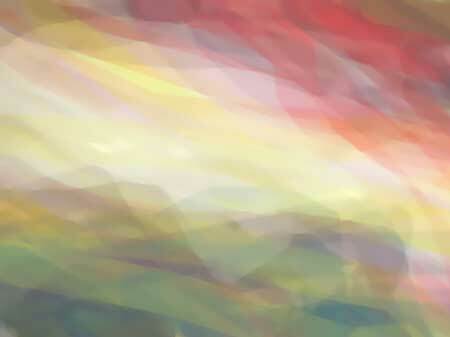 The only adjustment I made from the image as I painted it was emphasizing the diamond at the heart, forged in the layers upon layers of light and color. 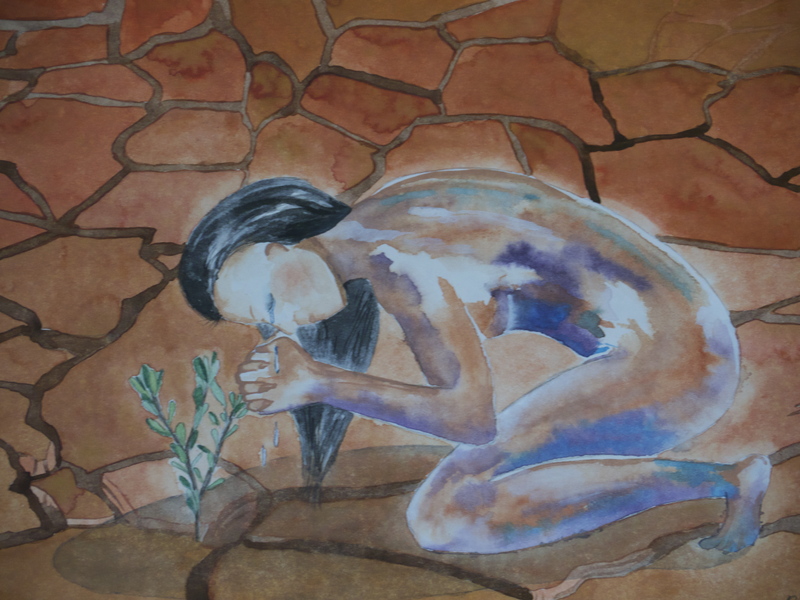 This painting of a drought-ridden desert with a single sapling growing in it is less an image of the Diamond Soul, but rather of the birth canal humanity seems to be entering before such soul transformation is possible. The painting is a representation of the changes rapidly being wrought upon the globe by human-induced climate change, and was particularly inspired by Bill McKibben’s book Eaarth: Making a Life on a Tough New Planet. McKibben provides the data that clearly demonstrates that global warming is no longer a future threat, it is a current reality. On a personal level this understanding was reinforced by a road trip I took across the American Continent this July while creating the concepts for this gallery. From Nevada to Michigan temperatures soared above 100° F, usually averaging at 104° but sometimes even reaching 108°. Fields were dry and often barren, and many cornfields showed yellowing leaves coated in a layer of dust. Yet oil wells continued to pump in these same fields by the roadside, and every building we entered was blasting arctic temperatures of air conditioning, all fueled by coal and oil burning power plants. In the painting a young woman is bending over an olive sapling, seemingly watering it with her tears. It is ambiguous if this is the last plant left growing in this barren desert, or if it is the first that has managed to survive. I chose the olive as this single plant because of the great lineage of symbolism connected to the olive, particularly in the Western tradition. The olive is the tree of Athens, mythically a gift from the Grecian goddess Athena who gave it to provide wood, oil, and fruit to the people of Athens. In return they named their city-state after her. Athens is the birthplace of democracy and as such the olive may also symbolize the democratic process. The olive is part of the painting to pose the question of the role of democracy, or perhaps its absence, in the onset and unfolding of the ecological crisis. The olive is also a symbol from the Hebrew tradition, a sign of hope in the Old Testament. When Noah sends a dove from the Ark to search for signs of land, the dove returns upon the second journey with an olive branch. The olive thus is the first growing plant after a devastating environmental catastrophe, the Great Flood, and also able to emerge out of a desert, but in the biblical case it is a desert of sea water. 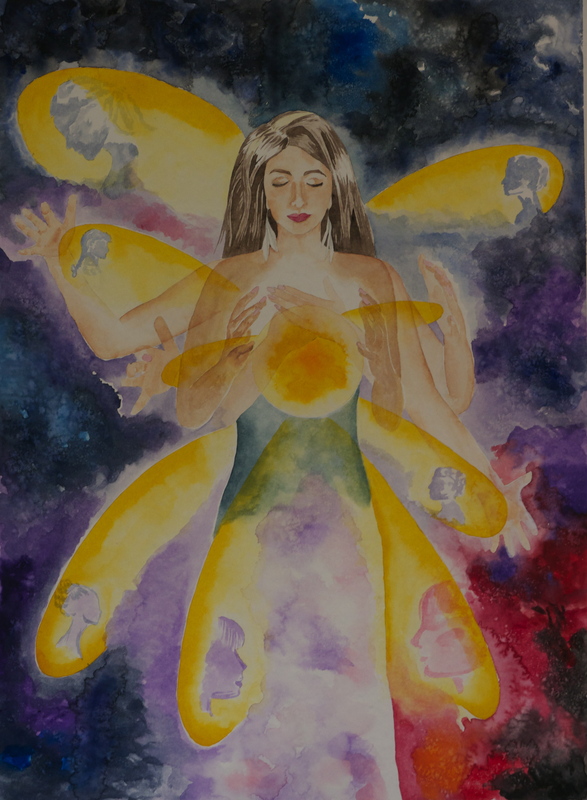 The woman’s body is painted in a multitude of colors to represent all races that will be affected by the ravages of climate change, yet it also has an ethereal quality to it, almost resembling the sparkling surface of a diamond, as perhaps she is approaching the stage of a Diamond Soul. 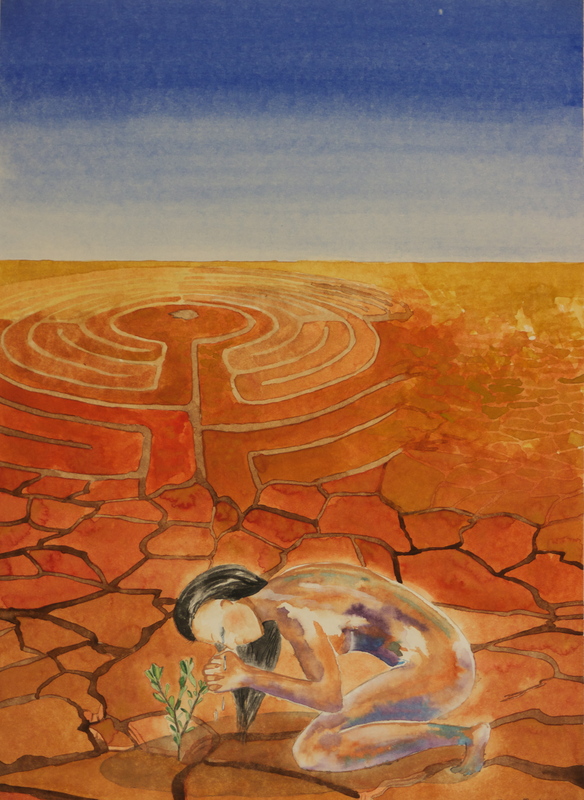 Finally, the labyrinth in the background represents the circuitous route of the human journey, of the soul’s journey, and of our pathway to learning and wisdom. Breathing Time was inspired by a meditative exercise presented by Bache during the Diamond Soul course in which each breath we took represented one hundred years, or approximately one human life. Eventually we brought the movement of our hands into this meditation, each expansion and contraction of the hands representing a lifetime. 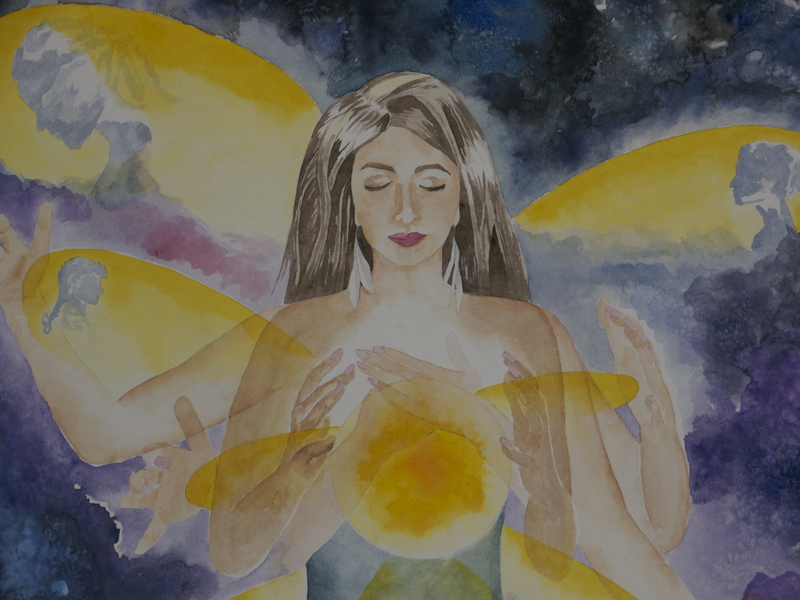 The energy created by this movement we slowly gathered into a sphere at our centers, then held it like a ball of light, before pressing the energy into our hearts and letting it fill our bodies. 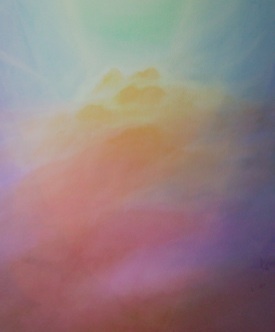 This painting is a visual representation of that meditation as I saw it during the exercise itself. In the painting, within the arcs of energy created by the breath and the moving hands are revealed faces, each one the face of a previous life. 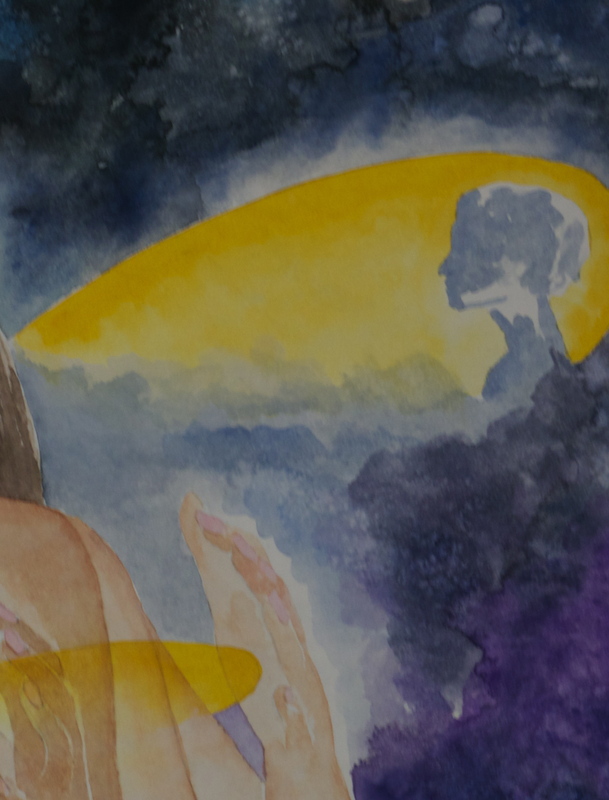 The faces are the color of the murky, nebulaic background indicating that the air may be packed full of these faces, full of lifetimes, but only the ones that are swept over with the meditative energy are revealed in that moment. There may be an infinity of faces present, just as we likely have an infinity of lifetimes to our souls. Bache, Christopher M. Lifecycles: Reincarnation and the Web of Life. New York, NY: Paragon House, 1994. Grof, Stanislav. Psychology of the Future: Lessons from Modern Consciousness Research. Albany, NY: State University of New York Press, 2000. Grof, Stanislav. The Cosmic Game: Explorations of the Frontiers of Human Consciousness. Albany, NY: State University of New York Press, 1998. McKibben, Bill. Eaarth: Making a Life on a Tough New Planet. New York, NY: St. Martin’s Griffin, 2011. When one has an encounter in the world, be it a deep sense of familiarity or peace in an unknown landscape, an attraction to an area of study, or a strong desire to make a connection with a newly met individual, that experience of novelty can often be intermingled with a quality of memory. Yet, while this remembering may have no connection to one’s present life, it still has an inexplicable air of destiny; this may be no memory of the mind, but of the spirit. It is a reencountering of the result of one’s own actions, but the actions of a previous lifetime. It is a lesson learned by a former self, a fruit nourished and watered by one’s prior being, to be plucked and savored in this lifetime. It is a seed of the past, a representation of one’s karma. The spiritual understanding of karma and reincarnation has been central to numerous cultures worldwide, and still flourishes in many religious and spiritual communities. Interpretations of both rebirth and karma differ greatly from tradition to tradition, and even person to person, as the fundamental questions of human existence are repeatedly asked by each generation. Who am I? What is my purpose? What is the purpose of the universe? Are there spiritual realms? Who, or what, is divine? While many answers have been given, those of two of the great spiritual and philosophical thinkers of the turn of the 20th century, Sri Aurobindo and Rudolf Steiner, speak not only to the unity of the divine in the universe, but also of the reality of the seeking and striving human individual. For Steiner and Aurobindo the roles of karma and rebirth are central to their philosophies and spiritual practices. Although Steiner hailed from Europe, Aurobindo from India, their views of reincarnation were either contrary to or differentiated from the prevalent beliefs established in their regions, but also deeply resonant with each other’s perspectives. Aurobindo brought to India a more Western view of the reality of the individual, and Steiner was given the weighty task of reintroducing the ideas of karma and rebirth to the West, from which they had been absent following the widespread establishment of Christianity (NES, 6). They both saw the cycles of human reincarnation as an evolutionary process, an evolution of the individual and of the whole of humanity, the universe, and the divine. 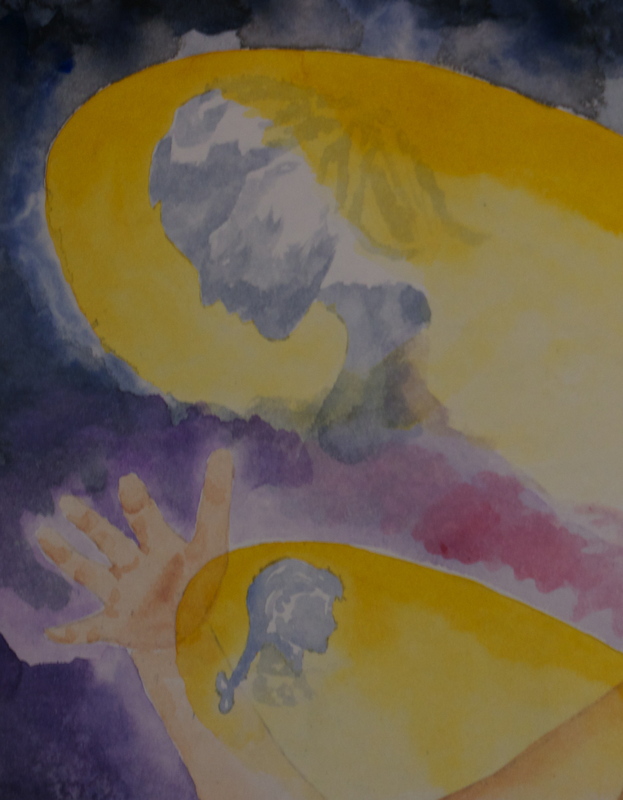 Rebirth, for Steiner and Aurobindo, could be defined as the joining of spirit to life and matter (EA, 92). Steiner called the moment when one karmic life ends and the new karmic life begins the “cosmic midnight hour” (NES, 47). Rebirth is a joining of the old with the new, the eternal spirit with a newly formed body, mind, and personality (EA, 265). Sculpting each life is one’s karma, one’s self-created destiny, which is formed by the prior actions of one’s spirit inhabiting other bodies during previous lifetimes (NES, 197). Our karma shapes not only the bodies, families, and cultures we are born into, but the road we travel and the obstacles and turns we will meet. How we will journey down this road, and interact with what and whom we meet upon it, is within our own freedom to choose, yet will lay the foundations for our future life’s karma as well. Both Aurobindo and Steiner emphasized the importance of one’s personal experience, how we choose to travel our path; it was through their own personal experiences that they each came to their spiritual understandings of karma and rebirth. Aurobindo writes that “if the soul enters this life with a certain development of personality, it must have prepared it in other precedent lives here [on Earth] or elsewhere” (EA, 95). Each human comes into the world with a fully unique personality, which cannot be reduced merely to physical heredity or one’s familial upbringing. Such a materialist perspective implies that the only part of us that persists beyond death would be our genes in our descendents, and possibly the fading memory of our actions in the minds of others (EA, 93). While we inherit the shape of our physical bodies from our parents, according to Steiner we inherit the shape of our spirits from ourselves. Although Homo sapiens is one biological species of which we are a part, each human individual is a spiritual species of which we are the whole (NES, 186). For Steiner this spirit is called the “I,” for Aurobindo the “psychic being” and it is this part of us alone which reincarnates (NES, 48, EA, 265). The reality of the individual spirit is as central to Steiner’s philosophy as it is to Aurobindo’s. The levels of Aurobindo––Matter, Life, Mind, and Spirit––have many similarities to the four bodies of Steiner: the physical body; the etheric, or life, body; the astral, or soul, body; and the “I,” or spirit body (EA, 109, NES, 129). The bodies Steiner describes also relate to the levels of minerals, plants, animals, and humans. For both Steiner and Aurobindo each level carries with it the characteristics of the prior level, which are all ultimately divine. Each human being has a spirit body, or an “I,” which participates in a greater “I;” this greater “I” could be called the divine, God, Brahman, Satchitananda, or the universe, and it too is in a process of evolution, in part because of the evolution of the individual human “I”s. Reincarnation of the human spirit is key to both Steiner’s and Aurobindo’s understanding of evolution. The spirit is shaped by not only its life between birth and death, but between death and new birth as well. Steiner described the period between death and new life as like the period of sleep we enter into each night. During sleep the astral and “I” bodies depart the physical and etheric bodies to spend time in the spiritual realm (NES, 44). After death a similar departure from the physical takes place and, according to both Steiner and Aurobindo, the human spirit enters the spiritual world (EA, 100). The “I” relives its life in the presence of the greater spiritual beings of the universe. It is with the help of these beings that our lives are guided, as they whisper wisdom to us during sleep, and help us shape the karma of our future lives after death (NES, 46). “We first become aware of what our last evil or good deeds signify for the world. Our experience of them while on Earth is now eliminated; what we now experience is their significance for the world” (NES, 45). Although in some passages Steiner writes of the effect of our deeds only upon other human beings, in the previously quoted sentence he broadens that view to encompass the world. This holds particular significance for the karmic structures being laid down by humanity today, as the destruction many human beings have been unleashing upon the earth becomes rapidly more apparent. The spiritual beings in whose presence we re-experience our lives “rain down their sympathies and antipathies” upon our actions. We release our good deeds into the universe to further its evolution, but we retain our evil deeds as the new work for our future life (NES, 46). Thus it is that we take our progressive steps from one lifetime to the next, building upon the lessons we learned that will guide us toward new ones. The new life begins with the formation of our astral and etheric bodies, which are created with the help of spiritual beings and planetary forces. These bodies are formed as the “I” passes the spheres of the Sun and the stars, and are determined by the limitations and attainments of the former life (NES, 47). These three bodies join the physical body, which, like the parents, has also been karmically chosen, in the womb a few weeks after conception. Similar to Steiner, Aurobindo writes, “The human birth in this world is on its spiritual side a complex of two elements, a spiritual Person and a soul of personality; the former is man’s eternal being, the latter is his cosmic and mutable being” (EA, 109). For Aurobindo, even the form of the physical body is dependent on the condition of the human soul, and Steiner writes that what is unique about our physical bodies––rather than what is inherited from our ancestors––is shaped by our soul body (EA, 92, NES, 189). Upon emerging once again into earthly existence we find it is much like awakening from a long night’s sleep. The results of our previous life actions have the effect of memory upon us, unrolling our karmic destiny before us (NES, 187). We even reencounter the same human individuals from one life to the next, as our actions throughout our lives connect us to each other (NES, 196). We do not do our work upon the earth alone. During the life between birth and death the astral body, which is the carrier of memory, “receives impressions from the outer world and carries them to the spirit, which extracts and preserves their fruits” (NES, 193). It is the spirit that carries the attainments of these fruits from lifetime to lifetime, which furthers not only the evolution of the individual but the evolution of humanity and the universe (NES, 191). This work is far beyond the span of a single lifetime, which is the reason that many human lives on earth are needed for this process (EA, 112). However, although the spirit of the individual is real and eternal, the complete human born each lifetime is unique, and work done in one life cannot be achieved in the same way in another. The imminence of death is as real as the eternal spirit, and can serve as a powerful impetus to do the work and learn the lessons this particular life has to offer. Because the divine involved itself in matter and is in a process of evolution, every rebirth is a unique expression of the divine (EA, 259). In each human being the divine is born with the inner qualities of that person. Therefore, every action is an action of both the human and the divine, and it is those divine actions which forge our karma. For karma to be real, the individual, and the divine that is the individual, must both be real as well. Through the individual the divine is thus able to come to consciousness (EA, 105). Aurobindo writes that “A spiritual evolution of which our universe is the scene and earth its ground and stage, though its plan is still kept back above from our yet limited knowledge––this way of seeing existence is a luminous key which we can fit into many doors of obscurity” (EA, 259). Existence has a true purpose if reincarnation is seen as an evolutionary process, in which the human spirit and the world evolve together toward consciousness, and ultimately, toward bliss (EA, 267, 268). Aurobindo and Steiner both developed spiritual practices with which to accomplish our tasks during our lifetimes; for Aurobindo this was Integral Yoga, for Steiner it was Spiritual Science, also called Anthroposophy. Steiner said that our task was to connect to our life before birth through free thinking; for Aurobindo our task was to know our previous lives and to connect to the unity of which we are a part (NES, 48, EA, 265). Both of them are offering spiritual practices that can connect us as individuals to the spirit realm in which we exist between lifetimes, the realm in which we can understand our unity with the whole. The spiritual practices of both these great thinkers are ultimately actions of love through freedom, and love can only be real when it emerges between entities that are real beings. As such, the evolution of the divine through the evolution of the universe is a process of love, as the real individuals that are each unique expressions of the divine are reborn again and again, and learn to come into true loving relationship with the whole. McDermott, Robert A, ed., The Essential Aurobindo. Great Barrington, MA: Lindisfarne Press, 1987. McDermott, Robert A, ed., The New Essential Steiner. Great Barrington, MA: Lindisfarne Books, 2009. 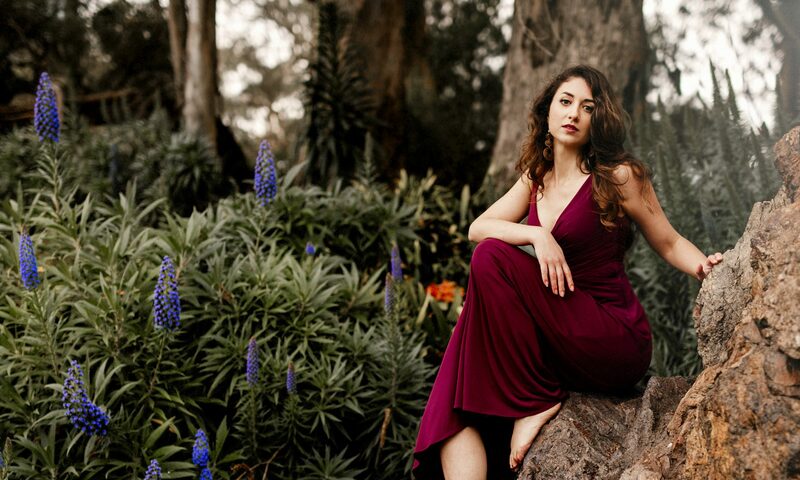 During our five-day course Nature and Eros, I was given the opportunity to work deeply with my own dreams and visions in a natural setting; it was an atmosphere where we were able to sink into the silence, a silence so pregnant that at last we could hear the full chorus of our dreams sing forth. The pivotal vision with which I worked during this time was a past life memory, which had been surfacing over the last few months leading up to this retreat. The memory was brought to the forefront of my consciousness by one of the dreams I experienced during the course. 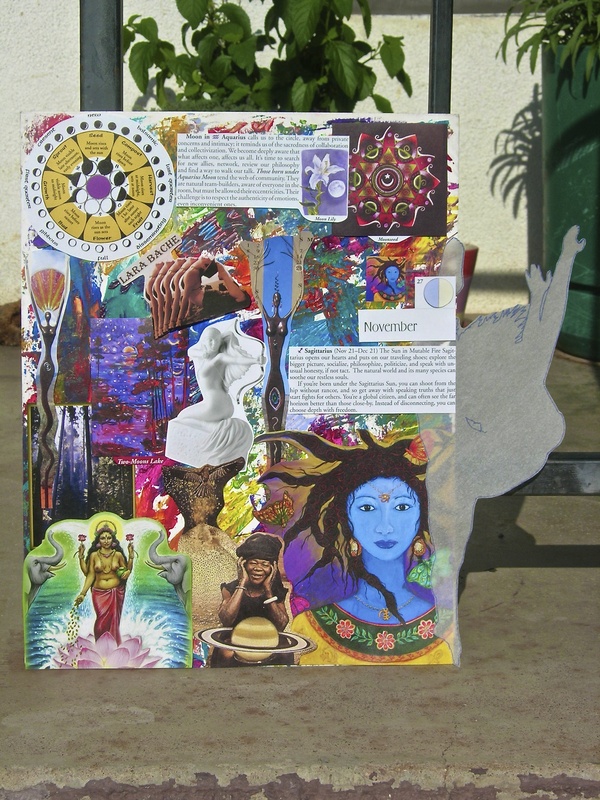 Working with our facilitator, Kerry Brady, I was able to reconnect with, and fill in more of, this past life experience to help incorporate my understanding of it into my waking life. …sequences that take place in other historical periods and other countries and are usually associated with powerful emotions and physical sensations…. Their most remarkable aspect is a convincing sense of remembering and reliving something that one has already seen (déjá vu) or experienced (déjá vecu) at some time in the past. Knowing that I carried these memories, I began to explore them recently to reach a better understanding of the experiences that have informed my psyche this lifetime. …it might suddenly seem that a certain person in one’s present life played an important role in a previous incarnation, the memory of which is emerging into consciousness. When this happens, one may seek emotional contact with a person who now appears to be a “soul-mate” from one’s karmic past. During the Nature and Eros course my past life vision was dominating my mind one morning following a series of intense, vivid dreams. Many of the dreams took place in a harem, or whore house, in Mexico or Polynesia that was ruled by a tyrannical white man. The native women were treated horribly, and were abused and mutilated. One woman hung herself, although she took on the form of a pink crab when she did so. I witnessed this hanging from the same visual angle as in my past life experience. The emotional quality of this dream triggered a need to process my past life memory while I had the support and knowledge offered in this retreat. I recounted my experience with Kerry while she asked me where in my body I felt it. I seem to carry the physical pain of the event in my neck and throat, but the emotional pain I carry in my jaw, which is the hardest to release. I came to recognize that the knowledge of my execution must have come suddenly, with little time to assimilate my approaching death. I felt the panic of those last moments, but the hardest part was after my body had dropped, knowing the action of my death had been completed, but my soul and life force had not yet departed my body. I felt the helplessness and sadness of those moments, and I kept repeating, “I’m sorry, I didn’t know this would happen.” I could see my partner kneeling before me, possibly my beloved in that lifetime also, and felt such pain at leaving him behind. With Kerry’s assistance I moved to lying flat on my back, which finally allowed the tension in my neck and jaw to relax. An image came to me of looking at my body lying in a field of wildflowers, my body melting into the Earth. There was deep comfort in that scene. The manner of my death was unnatural, but my body was laid to rest like all others and was able to dissolve back into the Earth. I honored the suffering of my former self, and also felt gratitude: her sacrifice allowed my soul to incarnate into my present life and body, to enter into such a good, nourishing womb and family. After lying for some time on the ground, I decided to go to the flower garden on the property where our retreat took place. I wanted to feel held in a womblike space, safe once again amongst the flowers of my final vision. Carl Jung’s archetypal interpretation of this image is that “The flower is in fact like a friendly sign, a numinous emanation from the unconscious.” Coming into this blossoming garden gave me a sense of healing and wholeness, a unity with my surrounding earth environment. My sense of being embedded in a womblike unity transcended that of the physical womb in which I was nourished this lifetime for nine months. It had a feeling of cosmic wholeness without any physical boundaries, perhaps a realm between incarnations. Could this place be the same realm from which dreams come? If so, it is a realm of infinite potential, comparable to the unmanifest realm, or quantum vacuum, of physics. According to Brian Swimme, this vacuum is not a place in the physical world, but rather pure, underlying, generative creativity. The unmanifest realm contains all that exists and all that could potentially exist. Elementary particles manifest from this place, then vanish back into it. The whole of the physical world constantly vibrates in and out of the unmanifest realm. Dreams are one form of communication between this realm and our waking conscious. According to Plotkin, “every dream is an opportunity to develop our relationship to soul, to who we are beneath our surface personalities and routine agendas.” Because we lose the control that we have while awake as we dream, we remain open to the truths that dreams can reveal. By accessing this realm I was able to recover my final memories of a life that ended violently; but this death also allowed my soul to completely enter the timeless place between lifetimes. On the final night of Nature and Eros I slept with the plant mugwort under my pillow, which is said to stimulate dreams. When I awoke the next morning I felt positive energy coursing through me in a way I have never felt after a dream. Much of the dream took place in rich, green gardens, echoing my experience the day before in the flower garden. A symbol also emerged from the dream, shaped like the glyph for the planet Venus, but with two long leaves on each side. The symbol represented the “Metaphysics of Mythology.” This was not a term with which I was familiar, and I could find no definition in my research, so I began to create my own definition. Myths are the translators of dreams, and the symbols of dreams are the messengers from our unconscious, from the unmanifest realm, the realm between lifetimes. Dreams are the mediators on behalf of our souls between the personalities of our current and previous lifetimes. They carry our soul narratives between the waking realms, whether it is between day to day in our present life, or between this lifetime and our past lives. As Plotkin writes, “Each dream provides a snapshot of the unfolding story and desires of the soul, and a chance for the ego to be further initiated into that underworld story and those underworld desires.” In this case, Plotkin refers to the underworld as the place of soul, to which we descend to uncover our true purpose in this lifetime. My integration of my past life memories is the first leg of a journey that I imagine will take me a lifetime. The initial step was learning to bear witness to the suffering of someone who is both myself and an other. Part of my soul journey this lifetime is to connect with the previous journeys of my same soul, and to assimilate those lessons left by past experience. These experiences come to us in the language of dreams and myth, which we can slowly learn to read by understanding the role they play in our development as individuals. Ultimately these languages connect us, during sleep and between lifetimes, to the same place: a realm of infinite creative potential teeming with the possibilities of all that we are, have been, will never be, and someday will eventually become. Jung, Carl Gustav. The Portable Jung. Edited by Joseph Campbell. Translated by R.F.C. Hull. New York, NY: Penguin Books, 1976. Plotkin, Bill. Soulcraft: Crossing into the Mysteries of Nature and Psyche. Novato, CA: New World Library, 2003. Swimme, Brian. Nature and Eros lecture. Tunitas Creek Ranch, CA: September 9, 2011. Carl Gustav Jung, The Portable Jung, ed. Joseph Campbell, trans. R.F.C. Hull (New York, NY: Penguin Books, 1976), 329. Bill Plotkin, Soulcraft: Crossing into the Mysteries of Nature and Psyche (Novato, CA: New World Library, 2003), 134-135. Brian Swimme, Nature and Eros lecture (Tunitas Creek Ranch, CA: September 9, 2011). Joseph Campbell. The Hero with a Thousand Faces (Novato, CA: New World Library, 2008), 1. Stanislav Grof, Psychology of the Future: Lessons from Modern Consciousness Research (Albany, NY: State University of New York Press, 2000), 162. Grof, Psychology of the Future, 162. Jung, The Portable Jung, 349. Jung, The Portable Jung, 329. Campbell, The Hero with a Thousand Faces, 14.